It is 1939. Russia teeters on the verge of war with Germany. It is also on the brink of bankruptcy. To preserve his regime, Stalin orders a search for the legendary missing gold of Tsar Nicholas II. For this task, he chooses Pekkala, the former investigator for the Tsar, to go undercover, returning to Siberia and the nightmare of his own past, where Pekkala was once a prisoner in the notorious Gulag known as Borodok. Fans of tales blending mystery and history, particularly readers who like crime novels set against the backdrop the Second World War, will find plenty to like in this intriguing third tale in Eastland's engaging Inspector Pekkala series. SIBERIAN RED is centred on a simple yet heroic man with a past as complicated as his country's: Finnish-born Pekkala was Tsar Nicholas II's special investigator, then a prisoner in the Siberian gulags, and is now Stalin's hand-picked, if not entirely trusted, investigator. Pekkala's formidable and moody boss is determined to find the Tsar's missing gold, so Pekkala goes back to the gulag, undercover, to solve the death of a man who may have held the key to finding the lost treasure. Once there, he attempts to infiltrate a convict gang still loyal to the Tsar. But can Pekkala survive the gulag a second time around? He has a legendary reputation due to his past exploits, but in a frozen wasteland where the Grim Reaper casts a long and ever-present shadow at even the best of times, prodding deep into a conspiracy-filled past is a shortcut to a short life. Pekkala is an interesting character: he was once the 'Emerald Eye' for the Tsar - the most trusted and most-feared advisor. Feared because Pekkala had sweeping powers to enter anywhere, examine any document, and to question or arrest anyone. At the same time he was immune to bribery or threats, making him even more feared by those with something to hide. Now serving a similar role for Stalin after paying penance for his ties to the past regime in the Siberian gulags, Pekkala has seen first-hand the inner workings of the past and present power structures, their differences and striking similarities. For readers this insight and perspective into a complex period of modern European history is fascinating, and like Pekkala we may find ourselves pausing to reconsider what we thought we knew. 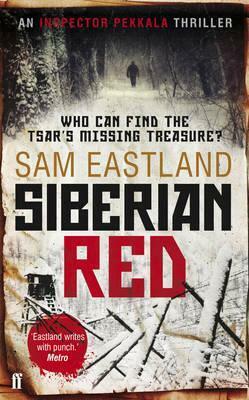 Even though SIBERIAN RED is the third book in Eastland's series, I didn't feel that I needed to have read the prior instalments to be up to speed. Like me, readers could dive straight in here and be entertained by an engaging tale full of history and some mystery - there is enough backstory threaded in for us to be aware of the depths of Pekkala's character and what he has been through, while still moving forward in the 'present time' of this particular story. A good, enjoyable crime tale. This is an expanded version of my review of SIBERIAN RED published as part of my crime fiction round-up in the Herald on Sunday newspaper on Sunday 17 March 2013.